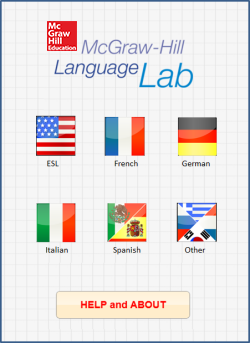 Welcome to McGraw-Hill Language Lab — your one-stop shop for great content to help you build your language skills, whether you are learning by yourself or studying for class. Our lab provides bonus audio and interactive content from our bestselling language learning programs. McGraw-Hill Language Lab This app lets you study vocabulary, grammar concepts, verbs, sentence structures, and more from some of our bestselling language titles. Designed by our expert authors, these flashcards, exercises, and audio recordings and review are perfect for study on-the-go! Having difficulties? 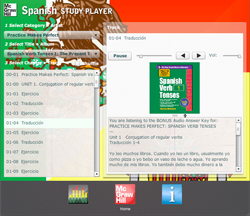 See the HELP AND ABOUT section within the app, or email: mhlanguagelab@mheducation.com. Note: This desktop application can be viewed using Chrome or Safari, but it will not work effectively with other web browsers, such as Internet Explorer and Firefox. A convenient and easy way to hear bonus and sample audio content from more than 250 titles, and over 30 languages.. Easy to navigate, the Audio Study Player combines audio and text. Note: This content requires Adobe Flash Player, which is not supported by all devices. It can be viewed on a desktop computer or on mobile devices that support Flash Player. Our library of bestselling Language titles are available in print and e-book editions. Download our full catalog of language titles.